At the conclusion of the ceremony, guests were invited to an informal reception in the University Center. Please contact the Office of Special Events at (412) 268-5052 with any questions. I came to know Herb four years ago, after I arrived at Carnegie Mellon as an assistant professor working at the intersection between computer science and neuroscience. He took an interest in my research because we shared a lot of common interests in the brain and in complex biological systems. We were both interested in learning how the brain actively constructs internal perceptual and memory representations, how eye movement, visual processing and reasoning can be integrated together. Most of the time, I would go to his office, which was full of interesting books, puzzle toys and stuffed animals. But sometimes, he would drop by my office and lab in the Mellon Institute. He was interested in learning how real neurons actually behave, and was fascinated by the various new techniques now available to probe into the brain. Talking to Herb, I would soon forget that I was talking to one of the intellectual giants of the world. He was simply an engaging and endearing colleague with a child-like curiosity. The fact that I was engaging in interdisciplinary research and that I was a Chinese gave us a certain kind of kinship and camaraderie. Herb had a strong affinity to Chinese people and Chinese culture. He had made many visits to China since the early 1970s. He had served as the chairman of a National Academy of Science committee on scientific exchange with China, and had played a very important role in fostering the scientific exchange between the two countries. Many of the books he acquired since the 1970s were signed with his name in Chinese -- Si-ma Huh. He was proud that Si-ma was the family name of the two greatest Chinese historians, Si-ma Chien and Si-ma Kwang, in Chinese history. Even when he was getting sick, he sent me an email to congratulate me upon hearing about my NSF early career development award in late November. When I bumped into him in the corridor of Newell-Simon Hall in early January, he was talking about grading the term projects of the 60 students in his course last semester. He is so much alive that his passing away is still incredible to me. He had been a nurturing teacher, an endearing friend and colleague to so many of us. We all miss him dearly. His life is forever an inspiring model for us all. " ""Can you read IPL-5?" Herb asked me back in 1985. Herb learned new languages quickly, and expected others to do the same. I wanted to try out some ideas I had for improving EPAM, Herb's (and Ed Feigenbaum's) model of memory that was written in a dead computer language known as IPL-5. So I poured over the IPL-5 programming manual and the source code of EPAM and soon had both running on my 64K home computer. Somehow that charmed Herb. For the next 15 years he was ever patient as we explored the problem space of variations on the EPAM model. Though I was just an independent scholar with no claim on his time, he would always be available to meet with me. We published several papers over those 16 years and were in the midst of writing a book that I will have to finish without him. What a teacher he was! " "Herb Simon was a friend of the Department of Philosophy in a very special way: he was responsible for its very existence! At least, he bears partial responsibility: in 1984 he was a member of the committee that recommended turning a small Philosophy Program into a genuine department. The department was to have a distinctive direction "appropriate for Carnegie Mellon" and that meant, to a large extent, a department mirroring Herb's interests in logic and philosophy of the social and cognitive sciences, as well as reflecting his insistence on addressing real problems. How intimately theoretical issues and practical affairs were intertwined for Herb! Having discussed some difficult administrative problems with him, he remarked without further explanation: Proceed, as if you were proving a theorem! I followed his advice and, low and behold, it worked: proving a theorem requires, after all, to look at the problem from a variety of perspectives and to expand lots of patience. " "Late one afternoon this past November, Herb and I were meeting to discuss how to present a very complex set of findings on human category learning. Our research group had been struggling to extract these findings from a massive body of qualitative and quantitative data, truly labyrinthine in its complexity. Herb had saved the day, of course, having invested possibly more than 80 hours alone in analysis, after our group had spent easily 10 times that without success. After he summarized the findings, we paused for moment as his presentation and my comprehension took all available capacity. He smiled and remarked with his eyes twinkling brightly that he had not had as much fun in a long time. An animated discussion followed in the next meeting in which we strategized about how to present our findings for publication. Herbs words were filled with energy and enthusiasm, and then punctuated by a wistful moment as he recalled, Allen and I faced the same situation after we had finished our analyses for Human Problem Solving. We corresponded the day before he went into the hospital for his surgery, making plans to go full speed ahead [his words] on manuscript revision following his recuperation. I will forever cherish his words and these moments -- and so many more. I feel immeasurably grateful to have been so incredibly privileged to work with this wonderful man. No doubt you feel the same. " "I met Herbert Simon in the fall of 1985 when visiting Carnegie Mellon as a prospective doctoral student in computer science. I had, as many others, already read quite a few of his writings. He emerged from his office and addressed me as "Sir" with a naturalness that endeared me instantly. Later as a grad student, my goal was to really learn about science, since I already had engineering degrees, industry experience, and a little research under my belt. So I would read different things from different sciences, and then at our meetings ask him to put them all in context for me. I especially remember his discussing a classic I had just read. It turned out he had read it 50 years earlier as a grad student himself, but interpreted the book as if we both had read it at the same time. I had the special fortune to meet with him alone once or twice monthly for over 14 years, not changing the format much. I internalized insights such as good science often starts with a question, to get something done, approach someone who's busy and many others, always focusing not on careerism but on science and, yes, truth. I learned to predict his reactions to topics that I learned well, but never to topics that required a simultaneous grasp of the technical, social, and organizational. Only he could take an issue that impinged on all these, interpret it, recommend an action, and explain it simply. " "Everyone knows" that Herb had strong views about how social science research ought to be done and that he had grave reservations about the neoclassical economics research agenda. Because economic phenomena were often very complex, Herb also believed that it was useful to examine them with several different lenses. Whether such pluralist views extended to include the neoclassical lens was not altogether clear, however. As a graduate student in Herb's class on Mathematical Social Science in the spring of 1962, I had the occasion to test that. The paper on which I had been working and wanted to submit as a term paper dealt with "Selling Expense as a Barrier to Entry" and used a constrained maximization set-up. I proposed this paper to Herb with trepidation. To my enormous relief his reply was, Anything that advances our understanding of complex phenomena is valued. So I went ahead with this project. My recollection is that Herb gave me a good grade on the paper and the paper actually helped me to get my first job upon graduation. (I submitted it to the Quarterly Journal of Economics, which published the paper in February 1963.) More importantly, I have tried to be a pluralist with my students in the years that followed. " "Herbert A. Simon was an example of a man I prized most highly as a remarkable human being - a very special transdisciplinary researcher, a beloved teacher and academic colleague. I prized Herb for his humility, integrity, humanity and scrupulous regard for sensibility, individual freedom and personal affection. Herb was quite a man for all seasons. Herb had that rare quality of transforming his academic and professional colleagues, students, alumni and those professionals who labored in the world of ideas in which he labored and made a lasting contribution. Herb touched people for their lifetimes. I can attest to his impact on the lives of the Kozmetsky family. It was Herb Simon who started me on my life's journey in application research in academia, business and technology in 1950 in the field research for the book "Centralization and Decentralization in Organizing the Controller's Department." Herb's work is timeless. "Gifts were exchanged each year during the December holidays. One year I asked Herb what he would like as a present and he suggested Bartok's string quartets on CD. I bought the CDs, wrapped them in gift paper, and placed them on the dining room table ready to take into the office. A week or so later I was shopping in a discount store. In the shoe department were slippers made to look like the feet (or paws) of different animals. One pair in particular struck my eye. I tried them on and my feet were surrounded by shaggy brown fur with four tan claws protruding from the front. They were bear slippers. I bought a pair, took them home, placed Bartok inside the slippers, placed the slippers in a box, wrapped the box in holiday paper, and took them into the office to give to Herb for opening on Christmas day. After the holiday break when I returned to the office Herb was already there, sitting comfortably, reading, with his legs crossed, and wearing the bear slippers. I couldn't believe my eyes, and said tongue-in-cheek, "You're not supposed to wear those at work -they're slippers!" Herb played dumb (imagine that): "Oh," he said, " I didn't know!" We both had a good laugh and the slippers became the source of numerous jokes and puns. What makes this an Herb Simon story? Well, the slippers became a research project. Herb was a scientist, and he questioned everything. We (he frequently included me in his hunts) needed to find out if the numbers of toes that were on the bear feet slippers were the same number of toes that real live bears have. We searched dictionaries, encyclopedias and the Internet until we found the answer. Were they the same number? Herb would want you to find out for yourself. After all, the fun (he once said) is in the pursuit - not in the find itself. Herb was a man who had an enormous curiosity about life and an insatiable passion for acquiring knowledge. He didn't want to know - he needed to know. That is what drove Herb Simon. " "When I first came to Carnegie Mellon in 1965, I had almost no experience in teaching. One of my first encounters with Herb Simon occurred in the first class that I taught a graduate seminar. Herb sat in on the class and afterward gave me some very practical (and much needed) advice about how I might teach better. That someone with Herb's prestige should care about how well or badly I taught was not lost on me. In 1977, I had a conversation with Herb in which I finally got the point of his position that if we really know a lot about cognition, we ought be able to teach it. That conversation was the critical event that led me to design my "Cognitive Processes" course in which I made a serious attempt to teach learning, memory, problem solving and decision-making skills to undergraduate students. Of course, I drew heavily on Herb's work and his advice. "Cognitive Processes" was first taught in 1979 and it is still being taught 20 years later. About 3,000 students have taken this Simon-inspired course. " Professor of Psychology and the Director of Center for Innovation in Learning(CIL) at Carnegie Mellon, which strives to improve education on campus. Dr. Simon was instrumental in helping to establish and then to guide the CIL. "Herbert Simon did not just touch the lives of people all over the world. For so many of us, the meetings in his office changed the direction of our lives. Perhaps the most important reason for Herbert's great influence was his unmatched willingness to listen carefully when other people described their ideas for projects. Through his amazing ability to understand and clearly articulate the often vague ideas we brought to him within the context of our own aspirations, he was able to give us unselfish advice and insightful guidance. Seeing how Herbert was able to help so many people develop their unique contributions inspired many of us to emulate him by doing our best to help others define and realize their personal goals. His effect on his many friends and through them on their students will contribute to making the world a better place for a very long time. This is the legacy of a truly great humanist, scientist and scholar. " "Herb Simon has been such a towering influence and determining force in my life that it is hard to imagine what my life would have been like without him. It was in 1959-60, as a sophomore at Carnegie Institute of Technology, that I first met "Dr. Simon." I mainly played chess, but he and Allen Newell, were programming computers to play chess. I believe we played some games together and I beat him. He said that my "program" was better than his. Then he hired me as a summer research assistant to work on chess machines! A year or two later he sent me to Amsterdam to help translate Adriaan de Groot's book on the thought processes of the chess player. When I returned, he directed my master's thesis on a mating combinations program, which he had already begun with his son, Pete. Like a clever father, he subtly transformed me from an aspiring chess professional -- though, more likely, impoverished chess bum -- into a cognitive psychologist. He also directed my doctoral dissertation, a computer simulation of some visual mental imagery tasks, though I knew he would have preferred me to continue working on chess. He was stuck with his prediction that a computer would beat the world chess champion within ten years -- it took 40. But sons must differentiate themselves from their fathers, mustn't they? By then it was 1967-68 and the war in Vietnam was still raging. I went to Canada. Though Simon's views on the war were much less clear-cut than my own, he supported me. He even said that I could defend my thesis by teleconference. Though that proved unnecessary, you can imagine how much that meant to me. We continued to correspond and occasionally saw each other, but our lives diverged, as lives do. Thirty years later, in 1997-98, I returned to Carnegie-Mellon University to do a sabbatical with Herb. It was as though I was his graduate student all over again: I presented my research problems and he helped me solve them; he presented his research and I struggled to understand it. I never really overcame my fear of his staggering intellect, but it mattered less because the love between us was so palpable. This was also the time when he had his major heart operation, and I felt privileged to be near him and Dorothea. He told me a dream he had while in the hospital, and I was thrilled to be able to offer an interpretation -- my turn to give. I am so grateful for those months in Pittsburgh. Thank you, Herb. I am so grateful for the decade at C. I. T.: Thank you, Dr. Simon. It is hard to imagine a world without you. May you rest in peace. " "My first encounter with Herb Simon was in 1965 at Al Newell's office in Carnegie Tech. I still see him entering the office full of enthusiasm, holding a bunch of computer printouts and exclaiming "EPAM is learning, EPAM is learning" - referring to the learning model developed by Ed Feigenbaum as part of his doctoral research under his supervision. Enthusiasm about ongoing artificial intelligence (AI) efforts/achievements and optimism about future research explorations were characteristic of Herb Simon; and they infected all who knew him. He had a strong sense of AI as an experimental science, and he felt deeply that the right approach to gaining an understanding of intellectual tasks was to build detailed computer models for performing these tasks and to test them empirically. He didn't have much patience with armchair theorizing about AI issues by scholars from various disciplines, including "AIers." I spent the spring of 1966 at Carnegie Tech, where, together with him and Al Newell, we ran a seminar on problem representations. This was a unique intellectual experience! We looked together into a great variety of problems, and we started to clarify the difficulties of choosing appropriate problem representations. For me this was a special opportunity to appreciate the sharp intellect, the critical insights and the breadth of knowledge of Herb Simon. I believe that the breadth of his knowledge and interests were unique. I always found it fascinating to discuss with him issues of common interest in AI - problem-solving frameworks, machine learning, theory formation, expertise acquisition, modeling scientific knowledge and ways of using it in computer-based applications in medicine and in engineering - as well as other areas of special interest to him in the social sciences and education. I had another experience of working with Herb Simon - when I visited Carnegie Mellon in the spring of 1984 at his invitation. My first memory is how gracious were he and Dorothea in hosting the Amarels, in helping us to find a house not far from Carnegie Mellon and in making our stay so pleasant. And this was a great time for me to discuss with Herb the notions of problem-solving expertise and expertise acquisition - after our experience of a decade of work (at Rutgers, in collaboration with Stanford) in the area of knowledge-based expert systems. Despite his reluctance to travel, he attended our workshop on High Performance Computing and Design at Rutgers in the summer of 1994, as a member of our Advisory Council, and gave us freely of his constructive comments, his encouragement and his challenge to push further in the exploration of AI in problems of design. Herb Simon will be much missed. For me, the world without him is very different. " "I met Herbert Simon for the first time in September 1954. I was a beginning graduate student assigned to Simon as a research assistant, and Herb immediately asked me to study a very large dynamic system whose transition matrix had many entries at or near zero. He had an intuitive sense that if zeros and near zeros in the transition matrix followed a certain pattern, then the system could be decomposed into a number of smaller subsystems that could be viewed as almost mutually independent in the short run. In the intermediate time horizon, under the same conditions, Herb believed that subsystems could be represented by indices, and the relation among them should constitute a relatively small system. The whole system could then be approximated by a hierarchy of simpler structures, enabling us to analyze and control it. It was a major and complex intuition. He, in effect, placed an incredible trust in an untrained new student and devoted infinite patience to explain the complex idea to me at the time. We did succeed in showing that his intuition was right. In the process, he transformed me from a complete amateur into a professional. Herb and I spent several hours together for the last time about a year ago. After nearly 50 years, he was still coming up with a whole set of major new ideas with boundless enthusiasm. I hope that he found all these years of collaboration between us worthy of his initial trust. " "In reading over the obituaries that came out shortly after Herb's death one is struck by how many different fields claim Herb as their own -- political science, economics, computer science, and psychology are perhaps the principal four. I am reminded of the story Herb told about how he amused himself as a young man when he used to travel by train across America. He would start up a conversation with some fellow traveler, inquire as to their profession, and carefully listen as they described what they did. Then when he was confident he understood the language of that profession, he would reveal to the traveler that he too shared that profession and then would try to maintain that deception for the rest of the trip. Herb must have sustained that deception for the 25 years that I knew him for I am firmly convinced that he is a psychologist and that the claims of the other fields to him are simply false. (He was, after all, a member of Psychology Section of the National Academy of Sciences.) "
"I met Herb Simon in 1992 in Walnut Creek CA. He is my husband's Uncle. He had a speaking engagement at Stanford and he and "Aunt Dottie" came to our home, spent two days with us. I was very much taken with him in every sense. I found him charming and endearing. I would have liked him under any circumstance, he did not boast of his achievements but was by manner and inclination a special kind of fellow. We went to a nursing home to see my mother in law, his sister in law. She had dementia and was skipping nouns in her speech which he noted right away. I did not pick this up myself, only noted her confusion. He had cared so much for my mother in law and was saddened by her decline. I noticed he was a gentlemen, opening doors for me, always dressed in a coat and tie and he "sprang" for an expensive dinner for five of us. I asked him what he thought was the biggest invention of the 1900's, he said "refrigeration" and all that went with it. My husband and I went to see them in about 1997 or 1998, he was on hiatus. He walked us nearly to death over at the University. We met Janet, looked at his papers, he spoke proudly of his grad students, his thoughts on AI. He and I shared a love for Southern grits! I also noted he was quite a stubborn fellow when Aunt Dottie told him his directions were wrong (they weren't). He also signed a sweatshirt for my son Mark ("it's worth fifty cents on any streetcorner"). I came away knowing he was a practical man by way of life and ways. He showed me his "copy" Nobel prize, the original in a vault, it was unimpressive in appearance, he agreed and said the original was just like the copy. On a funny note, while we were there, his condo has a suite for guests and the toilet did not work. He was quite upset and tried to fix it himself then immediatey called the condo maintenance person. I went home so happy that I had met such a well rounded individual that knew real joy in all discovery of new knowledge. I am grateful. We also have a number of pictures of him from family excursions and we have a paper of his from around (my date maybe wrong ) 1956 or so probably while he was at UC Berkeley that his mother in law kept (they lived with her). Sherry Snyder"
"Dear Friends: With so many others, the death of Herbert Simon was an occasion for sadness and reflection. He was one of the best scholars of our time. I am particularly qualified to say this, for I had indispensable help from him during his life. He was a master both of the analytical instruments of economics and the ability to communicate them in a wonderfully clear and literate way. This was what brought me together with Herbert Simon, but I then learned there was another quality: he was a marvelously interesting, kind and generous person. I conclude on an often used line, slightly modified: we will never or at best rarely see his like again." "My fondest and most vivid memories of Herb Simon are all linked to his office in Baker Hall. This did not feel like your typical academic office, despite the books lining its walls, the papers stacked on its tables, or the expressions on its slate blackboard. Herb's office felt more like the living room in the house of an older, valued friend. That was probably due more to Herb's personal style than to the office itself. He always sat in an easy chair, with no intervening desk, and he treated even the least experienced student with respect. Meetings were invariably exciting and led to new ideas, and yet they were also relaxing. Herb was always interested in what you had to say and, though he might disagree with you, he never seemed to judge. Nor was there need to worry if you were short of ideas, as Herb always had something engaging to discuss. Somehow, the physical space he engendered was friendly but fully professional, challenging but always respectful, and comforting but genuinely creative. I count my visits to Herb Simon's office, and my meetings with him and colleagues there, as the most memorable, enjoyable and important times of my life. On another front, I have always been something of a perfectionist, which has often led me to take longer in finishing papers than might be desirable. One of Herb Simon's favorite lines was "Anything worth doing is worth doing badly," which he used to encourage me and I suspect, many others. It took me years to realize that he meant this as more than just practical advice, and that it followed directly from the theory of satisficing and bounded rationality that was the cornerstone of his intellectual career. However, to my knowledge, Herb Simon never wrote a bad paper in his long and productive life. But then many of us have long suspected that his rationality was far less bounded than was our own. " " "A GREAT MIND IN THE FIELD OF COMPLEXITY HAS LEFT US. 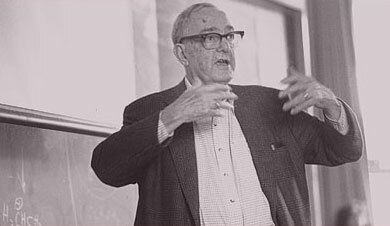 Herbert A. Simon, was an exemplary scientist and researcher who invited us to apply an interdisciplinary intelligence to the viewing of complexity. He died in Pittsburgh, USA at 84 years of age. Simon received the most prestigious titles and prizes (Nobel Prize in Economics in 1978, Turing Prize in Information Science in 1975, National Medal of Science, USA, 1986). His election in 1994 to the Chinese Academy of Sciences, and in 2001 to the Third World Academy of Sciences are the most meaningful memberships of all, in that they signify the unity and universality of science across international and ideological boundaries. For the European Program for the Modelization of Complexity and of the Association for Complex Thinking, H.A. Simon was the pioneer who incited us to pursue the nature of complexity. We read avidly his first important article on the "Architecture of Complexity" published in 1962 and which serves as a foundation on how to conceive the modelization of complex processes which Simon went on to study in all kinds of disciplines. We will continue to be inspired by Simon's personal modesty, his stimulating mind as well as by his impressive scientific achievements which reveal how a practical and interdisciplinary approach to the quandaries of science is possible, as long as it is guided by a rigorous epistemology. For those among us who have not as yet had the pleasure of approaching Simon's work, we refer them to a commentary which we provided on the occasion of the publication of Simon's autobiography entitled, very symbolically, "Models of My Life." The text of this commentary can be found in the Letters of MCX-APC which appeared at the time. His new readers will find that the ten years which followed the publication of his memoirs were as productive as the previous ones. As proof, in his bibliography of those ten years, we find 200 entries. A partial bibliography of Simon's work can be found as an addendum to the French translation of "Sciences of Systems, Sciences of the Artificial" published by Dunod, Paris, France, 1991. WHILE WE HAVE SUFFERED THE LOSS OF A GREAT MIND, HIS WORK WILL LIVE ON" European Program on Complexity Modeling Association for Complex Thinking (www.mcxapc.org) Jean-Louis LeMoigne, Professor Emeritus University Aix-Marseille "
"My memories of Herb feel very personal, but he meant so much to so many that I wish to leave this small remembrance. I met Herbert Simon in 1975. I had come to Pittsburgh, my first visit to the city, for an interview for a position as his study director at the National Academy of Sciences in Washington. Our task was a study of the social and behavioral sciences. This job would turn my life in a new direction. My earliest discovery upon working with Herb was that a normal academic work routine was not going to cut it. I needed to work much, much harder! Herb's capacity to see what needed to be done, and to do it almost in the same moment, was astonishing. It seemed at the time a race to get the data, the analyses, the interviews, the lines written--to do my job--or else Herb would do it for me. He introduced me to writing and editing online, to economics and anthropology, and to organization science. He advised me to read Science magazine diligently--all of the articles. He turned every mundane observation, every small disagreement into a memorable insight. (One disagreement concerned his staying at the men-only Cosmos Club. I cannot recall if he relented but I do recall the discussion of affirmative action.) His genius was to expect more of people than they did of themselves. His standards of excellence for work, for learning, and for interpersonal conduct will guide my life forever. " "Herb was one of my intellectual heroes, and an occasional but invaluable source of advice. When I was a PhD student in computer science, Herb wasn't on my thesis committee but was kind enough to meet with me anyway. When I planned to do my thesis on language learning, Herb showed me a book for learning Hebrew from pictures. That would still make a cool thesis today! I wound up switching topics to the problem of "operationalizing" advice for the card game of Hearts -- e.g., "avoid taking points" -- into a form that a player could actually execute -- e.g., "play a low card." When I asked Herb's advice about using a musical composition task as a test of generality, he recalled a program that a grad student named Robert Dupchak wrote almost 20 years earlier to harmonize a Bach chorale, and pulled out a faded purple mimeograph, "C.I.P. Working Paper 54." No wonder we grad students called Herb a walking encyclopedia! Some of us started a machine learning group. We kept trying to define machine learning, but every definition allowed some trivial cases -- violating our intuition that machine learning is interesting! After weeks of effort, we mentioned this impasse to Herb, who promptly cleared up the whole issue by explaining that "interestingness" is socially determined rather than an intrinsic property. When I was agonizing in 1985 whether to accept a job at Rutgers, Herb advised me to assume that whichever decision I made was correct, since there was "no way to run a controlled experiment." Since then, I have passed on this comforting advice to many others making major life choices. When I told Herb in 1990 that I wanted to get computers to read aloud, the first thing he said was "Sounds like a good idea." Knowing that I was a proud new dad, he then predicted that my daughter would learn how to read before my system worked. A few years later I was surprised to see Herb watching some construction on campus. When I reminded him of the story, he asked how his prediction had turned out. (Hard to tell, I explained -- my daughter could sort of read, and the system sort of worked.) Herb's consistent support for Project LISTEN meant a lot to me. Not just hear, but help. Not just mild, but kind. Not just sage, but Herb!" "May I express my sadness at the news about Herb. I only met him twice. Both times I was delighted by his down to earth character and very wide intellectual range. I happen to have been honored to win the first Simon award by New England Complex Ssystems Institute, and I am grateful to Herb for his kind taped message. Stuart Kauffman "
Chief Scientific Officer and Founding Partner of Bios Group, Inc.
"Professor Simon is the chair of my dissertation committee. His passing is a tremendous loss for me. I will never forget his unique and thoughtful advice to me. In my opinion, Professor Simon created a new and unique way to supervise Ph.D. students. After he volunteered to be the chair of my second research paper, he emphasized that being creative was more important than just running experiments and testing hypotheses. He told me there are too many hypotheses for a person to test them all. It’s important to invent new ways to approach problems. (We always used graphs as representations to describe problems.) Every talk with him inspired me to come up with more and more creative thoughts. When I first talked to him about my dissertation topic, he said, “The topic should be fundamental.” So we chose to study the thought processes of collaborative scientific discovery based on cognitive science, artificial intelligence and organization. Professors Simon and Newell proposed the theory of human problem solving, so Professor Simon suggested I should focus on collaborative problem solving. After lots of interesting discussion, we created a new methodology to study how people interact with each other to make scientific discoveries. That is, we proposed a three-dimensional structure to model knowledge transference among research collaborator. Professor Simon is a great mentor who cares about students. While we worked together, he always respected and encouraged me to come up with new ideas independently. I never felt any pressure working with him although I had thought at first that I would since he is such a distinguished world-class scientist. Professor Simon taught me how to be forward-looking in research. During the past two years, our interactive discussions resulted in not only my second research paper and my dissertation but also a series of interesting research topics on which I can work for at least five more years. Right before Christmas in 2000, Professor Simon, Professor Rousseau and I had a wonderful time together discussing my dissertation plan and future work with him. He told me to send him an email to schedule one more meeting with him in the winter break. I thought the weather was too cold for him to come to school and hence we scheduled the meeting in the first week of the spring semester in 2001. But I never thought that our December’s meeting would become my last time to talk to him. I feel immeasurably grateful to have been so privileged to be his Ph.D. student. I miss him dearly and will remember him forever. " "I had the fortune of taking a reading course with Herb Simon in the Spring of '93. It was a most enriching experience, and it was amazing how well informed he was on a diversity of topics. We discussed the Ayodhya temple/mosque dispute in India, the state of the European common market, strategies for argument, various philosophical theories, the views of Roger Penrose (whom Prof. Simon somewhat disparagingly referred to as "Mr." Penrose, on the plea that he, Penrose that is, was not an expert in the subject!) on AI. I myself differed philosophically from Prof. Simon in his views on strong AI, but was gratified that at the end of the semester Prof. Simon had awarded me an `A' for my efforts, despite our constant debates. Years later, when I had occasion to ask Prof. Simon for a reference, he gave me one without hesitation, writing kind words about my readings with him and a paper of mine on a different topic that we had discussed. The brief time that I knew Prof. Simon, and the few lectures by him that I attended, will certainly be objects of treasured memory for me. He was an embodiment of all-round scholarship, and even more importantly, was a true gentleman in the finest sense of the word. The academic community as a whole, and CMU in particular, are poorer for losing Prof. Simon, and I can only hope that every sincere student has the opportunity sometime, as I did, to have known and received guidance from some scholar of the caliber of Prof. Simon, so that his life may be enriched by the experience, and his work and values ennobled likewise. " "It is extremely difficult for me to explain the profound change in my scientific thinking occurred when I first met professor Simon in far off 1986 (my first meeting with him). I would simply mention two events which mark my ever continuing dialog with him. -That the day before my first programmed encounter with him at Carnegie Mellon, I was sitting by myself in the immense University Staff restaurant when he came spontaneously to my table and initiated a scientific discussion about my ideas while finishing his small cup of strawberries . Needless to say, I was impressed and I received a sense of profound appreciation. - The last event (July ’00) on the monitor of my desktop, I saw his e-mail with the question "How are your researches", and some hours later another e-mail signed "HAS" with further specifications. … I was not alone at my desk with my scientific task. I seem to have lost a marvelous human link with a conception of Science , which is one of the highest expressions of the liberty of human thought. What remains on my shelf, on my desk, are the exceptional and extraordinary numerous scientific papers and books of his thinking on his cognitive revolution, on our cognitive revolution. Gianpiero Bussolin Universita' di Torino,Dipartimento di Informatica,Aprile 2001. " Full professor and chair in Business Administration. ""What new data do we have about chess today?" Herb would often ask at the beginning of our almost weekly meetings, which lasted from 1990 to 1995. He was immensely curious to learn about new phenomena, and had an obvious pleasure to analyse data, always looking for hidden patterns and better representations; as many of us have learned, Herb was outstanding at making sense out of complex data sets. Herb’s curiosity was always present in our meetings, well beyond scientific data. For example, he had a passion for learning and improving his knowledge of foreign languages (he had translated scientific work from Russian and Dutch, and probably from other languages as well). When he volunteered to read the draft of my thesis in French, I expressed my worries about the time it would take. He reassured me: "Your French is much easier to read than Proust’s." Herb was also very generous with his students and colleagues. When some arcane immigration regulation allowed me to be employed by Carnegie Mellon University, but not to be paid, Herb did not hesitate to support me financially for a couple of months. Meetings with him were alternatively dense and relaxed, focused and wide-ranging. His informal style made you sometimes forget that you were talking to one of the greatest scholars and one of the last true humanists of the 20th century. While open to new ideas, he also had little patience for bad ideas. However, even then, he managed to refute them in a way that didn’t make you feel too bad. He was exigent and expected his collaborators to share his passion for work. But of course, the results were highly rewarding. In a very elegant and efficient way, he taught many of us much about science, and mainly that scientific research can be an exciting voyage of discovery. Fernand Gobet Allan Standen Reader in Intelligent Systems School of Psychology University of Nottingham Collaborator on research into expert behaviour "
"In 1996, during the 2nd year of my graduate studies in CMU's Psychology Department, Herb invited me to join him, Howard Richman, and Jim Staszewski in their weekly meetings on the topic of EPAM models of category learning. I may not be the sharpest stick in the forest, but I know a good learning opportunity when I see one, so I accepted Herb's invitation. Soon after that, we decided a new study was required, involving verbal protocol analysis of the trial-by-trial behaviors of participants in a Brunswik faces category learning task. Working with Herb on (or more appropriately, Herb teaching me about) the analysis of those data was one of the great joys of my grad school years. In December of 2000, Julie (my wife) and I were back in Pittsburgh visiting her parents for the holidays. Happily, this provided two more opportunities to meet with Herb (and Jim and Howard) to discuss the latest analyses and the current state of our paper describing the results. At the end of our last meeting, the conversation turned to other matters. One topic was an Air Force project I'm involved with in which we are comparing cognitive models created with different architectures. Herb was particularly interested in the similarities among these architectures, and evidence for convergence of ideas with respect to representation and process. He asked me if I thought progress was being made. I told him I thought it was slow, but identifiable. The last thing we discussed was an upcoming class I was scheduled to teach on cognitive modeling. As I stepped through the door to leave, Herb made me promise not to use overhead slides. "Talk with them," he said, "And write on the board." I made good on that promise this past Spring. At the time of this meeting, of course, I had no idea it would be our last. Herb had said nothing of his upcoming surgery. Looking back on those last two topics of conversation, I see that they reflect two of the great intellectual passions in Herb's life, teaching and cognitive theory, which clearly were on his mind right to the end. Thanks for the lessons, Herb."